We are seeing a growing trend towards providers integrating IM,Social Networks and Emails are trying to integrate all the services. Example: Orgoo is still in its infancy stage and few people are getting access to it through invites only. 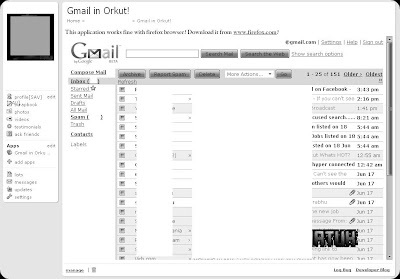 Gmail App is a step towards integration of Google Services. Firstly, I was concerned if I had to Login, as you have to be extra cautious to enter your login details. This App logs in automatically. Secondly I was unsure about it's speed. It loads reasonably fast. Finally I found quite a few bugs in the display and login.I was logged in my alternate profile.. I hope they fix them soon. Overall It's a value added App. Add Gmail App on your Profile .